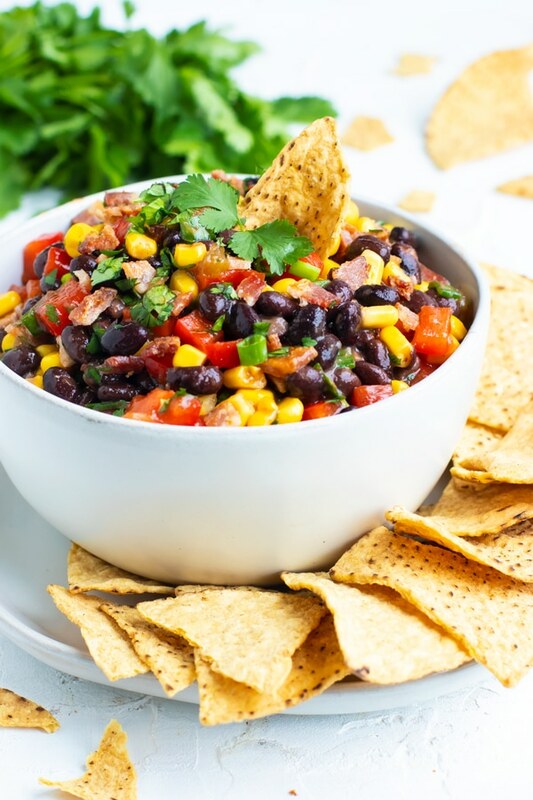 Black Bean and Corn Salsa is a quick and easy party dip recipe to make for Christmas, New Year’s, Super Bowl or game day parties. 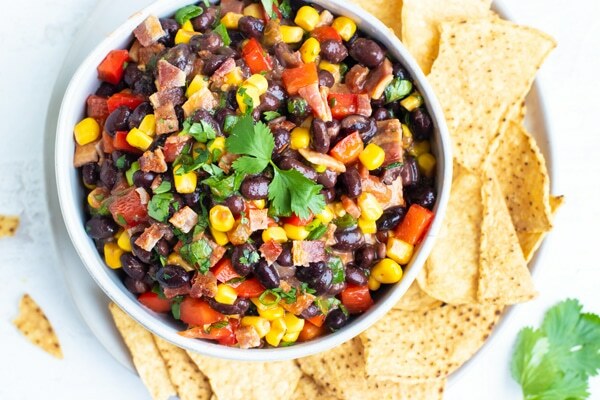 This simple black bean dip recipe is loaded with corn, salsa, crispy bacon, and green onion goodness and tastes amazing served with tortilla chips! 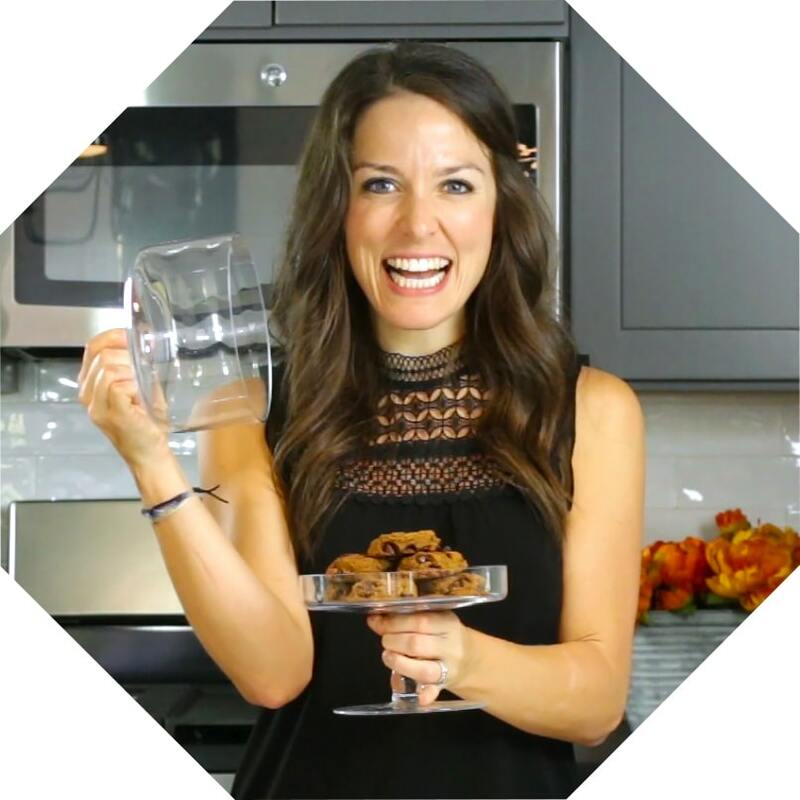 Easy Black Bean Dip for Your Party! Growing up I remember my parents throwing this black bean and corn salsa dip together whenever we would have a party or church get-together to attend. 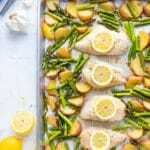 It was quick, easy, delicious, and everyone always asked for the recipe. Not to mention, the bacon had to be taste-tested before it was added to the black bean dip! 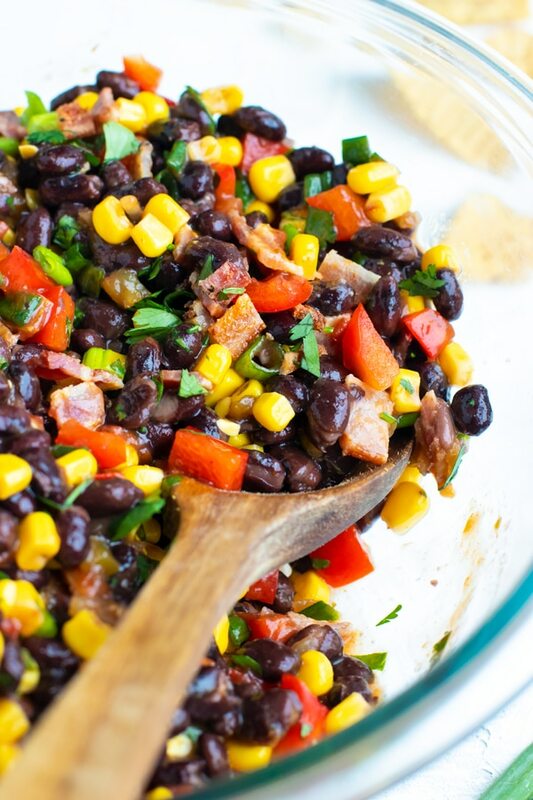 A few small tweaks later, I still find myself turning to this black bean and corn salsa recipe when throwing a party. 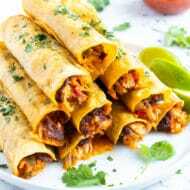 It’s a bit more filling than your traditional salsa or guacamole, but is still full of Southwestern flavor that just about everyone loves. 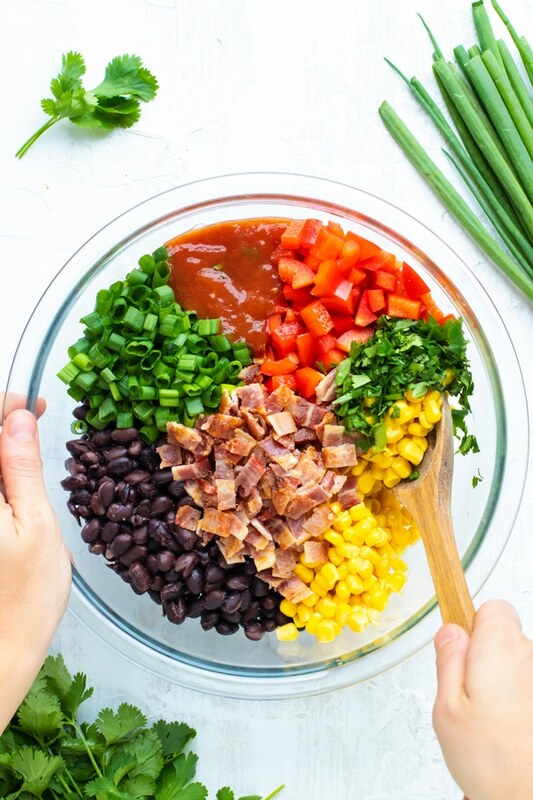 Read on below to learn how to make black bean and corn salsa, the ingredients needed for this easy dip recipe, different ways to cook bacon, and what to serve it with. This black bean dip is SUPER easy to make and is what I like to affectionately refer to as a “dump-and-don’t-bake” recipe. 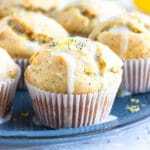 It is one of those easy party appetizer recipes you can turn to in a pinch, because quite honestly, you probably already have a large majority of these ingredients in your pantry. 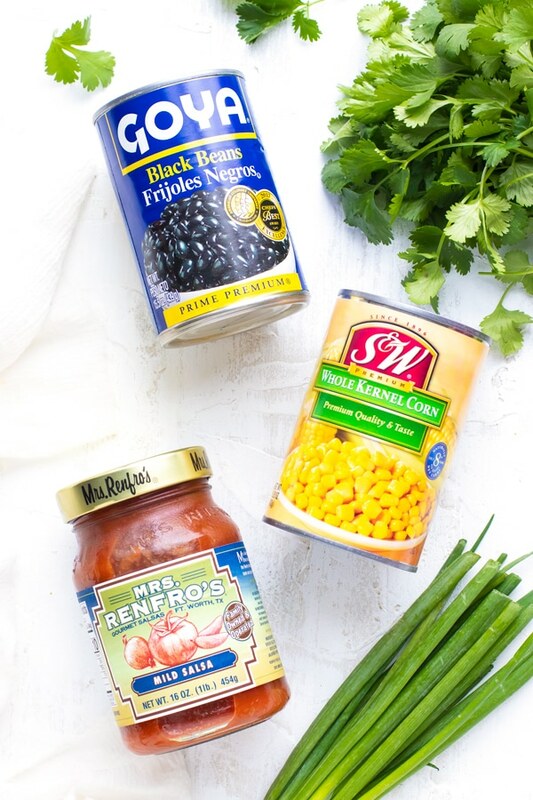 Canned black beans – Not the refried kind. You want to make sure to get unseasoned, canned WHOLE black beans, and preferably organic. Canned sweet kernel corn – Just the regular canned corn. Make sure you do not get the canned cream of corn. Salsa – Mild or medium salsa works great, but try to avoid the hot kind. I prefer a thicker, chunky salsa to give it some tomatoey bites. Bell pepper – My personal preference is a sweet red pepper (plus the color is beautiful!) 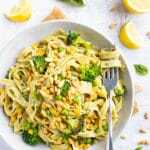 Although you can also use an orange, green, or yellow bell pepper, too. 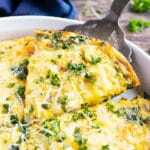 Green onions – Try not to substitute other onions for these. Sweet onions and red onions will be a bit too potent for this recipe. Cook’s Tip: RINSE, RINSE, RINSE the canned black beans! Canned black beans normally come with quite a bit of bean juice and will hugely affect the result of this black bean dip. 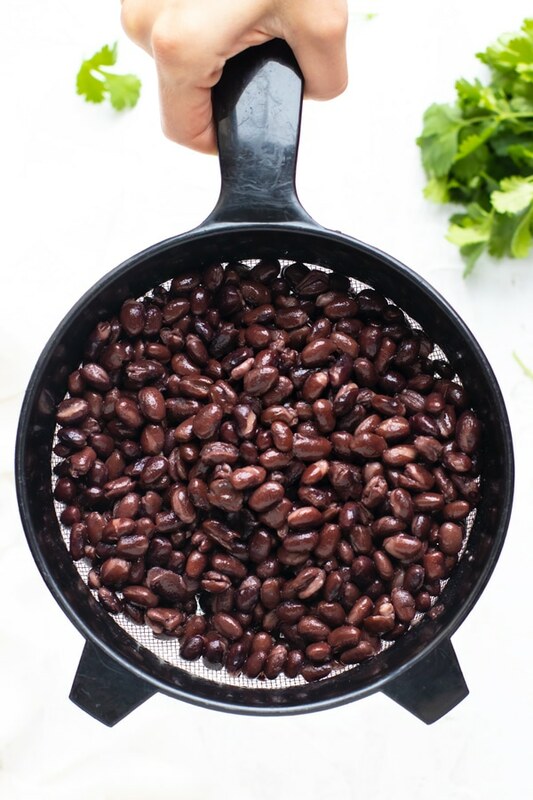 So make sure you rinse the black beans thoroughly (I prefer a mesh strainer like the one pictured above) and dry them completely before combining with the remaining ingredients. Traditional stove-top method – I think you know what to do here. 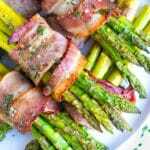 Bake the bacon in the oven – The best way since you do not have to hover over the sizzling bacon and it’s hard to mess up! Microwave the bacon – Ummm…. if either of the other ways fail? But I would not recommend since the bacon will not get it’s beloved crispiness! Once you have mixed together all of your ingredients, you can either add the bacon and serve immediately, or refrigerate the dip (minus the bacon!) for at least 30 minutes. If you have the patience, refrigerate it! 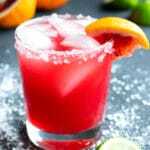 The flavors will meld together beautifully and it tastes really great served cold. Also, keeping the bacon separate from the dip until ready to serve will help it keep it’s crispy goodness. The black bean dip is ready to serve, but what should you serve it with? 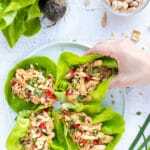 Tortilla chips – Hands down the BEST option! Thick, sturdy tortilla chips work best since this is sort of a thick dip. 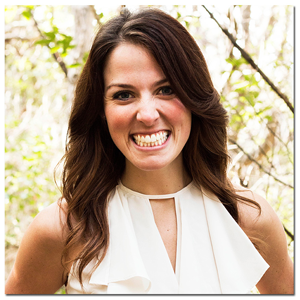 Grain-free “tortilla” chips – A great option for those avoiding corn or grains altogether. 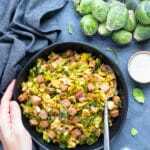 On top of a taco salad – Delish! And a great way to add extra flavor to a boring salad. 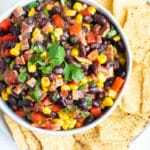 Black Bean and Corn Salsa is a quick and easy party dip recipe to make for Christmas, New Year's, Super Bowl or game day parties. Cook bacon by the traditional stove-top method, or you can bake your bacon in the oven. Just before serving, stir in ¾ of the bacon. 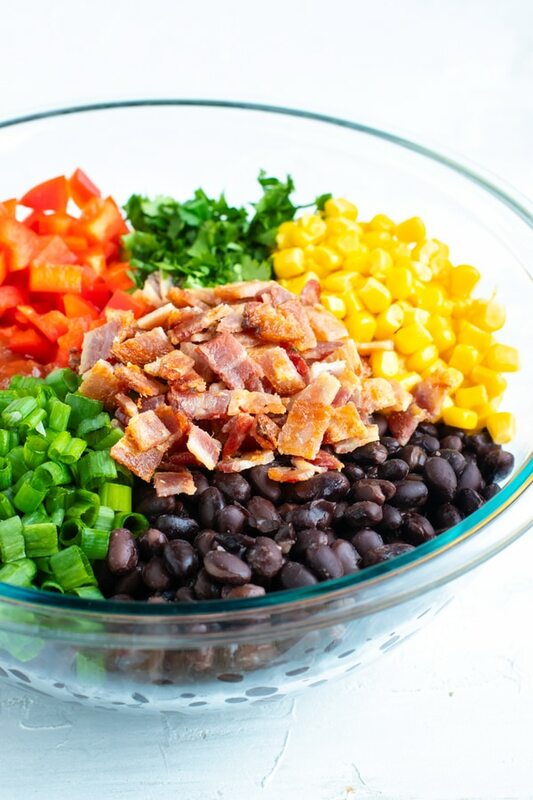 Top the black bean and corn salsa with remaining bacon pieces and serve with tortilla chips. Enjoy! 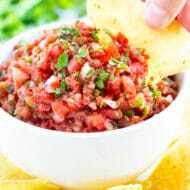 Use mild salsa for a mild black bean dip and medium salsa for a spicier dip. Do not mix in bacon until just before serving so it stays crispy. I definitely can see myself polishing off a large bowl of this delicious dip — I love how easy it is to make.. and the addition of bacon is seriously making my mouth water. Yup, I think my arteries might be a tad clogged with all of the BLT (+ a few more ingredients) sandwiches I’ve been eating lately. Just can’t beat the bacon! lol Thanks Thalia!